e-Highlights: March 1. 14 Adar. For the weekly minyan schedule, please see This Week at TBH-BE. Nancy Brown on the engagement of her daughter, Lisha to Joseph Kampman. Marsha Woods and Jennifer Cotler on the loss of their grandmother, Devorah Faigenblat (z”l). Michal Wachs, and Leora Zabusky. We are no longer accepting RSVPs for tomorrow night's Shabbat Dinner. Led by Emilie S. Passow, Ph.D.
Prof. Passow examines the Book of Jonah and how it explores many important guidelines for spiritual growth in our Jewish faith, including: courage, atonement, empathy, forgiveness and humility. 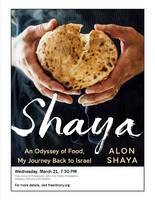 This four-part course is jointly sponsored by Adath Israel and TBH-BE and will be held at Adath Israel. The course is free. 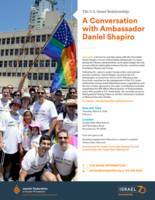 Register in advance: Email Barbara Sharofsky (bsharofsky@adathisrael.org). TBH-BE​​​​​​​, in partnership with the Jewish Federation of Greater Philadelphia, welcomes the Honorable Daniel Shapiro, former Ambassador to Israel in the Obama Administration, who will discuss the current political relationship between the U.S. and Israel. 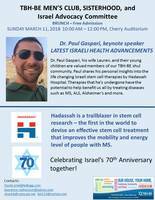 Men's Club, Sisterhood, and Israel Advocacy Committee welcome our own Dr. Gaspari to share his insights into life-changing stem-cell therapies underway at Hadassah Hospital. Brunch is free. 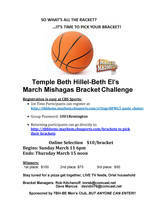 March Mishagas Bracket is Coming! Gather a group of the brightest, brainiest, and coolest people you know for Quizzo, cocktails, and a whole lot of fun! $36/person; 8-10 members/team Register today! Meets Fridays, 9:30 - 10:45 AM Enroll now! For more information or to request a date, please contact Barbara Schwartz at bschwartz@tbhbe.org. Thanks to everyone who helped with our Mishloach Manot fundraiser. It was a great success. If you did not receive your bag or if you received an incorrect greeting, please contact Robin Zwick at rlzwick@comcast.net. Our Art Show Was a Success! Thanks to the many, many volunteers, without whom this show would have not been possible. Also, thank you to all our members who supported the show, visited the Gallery, and purchased some beautiful Israeli Art. REMEMBER: Our “Preferred Framer” Framers Market Gallery (644 Haverford Rd., Haverford) will donate 20% of the total purchase price of your custom framing order through April 30, 2018. Now's the time to frame your artwork from the show, those “Super Bowl” newspapers, even your kids’ diplomas! Anything you frame at Framers Market Gallery directly benefits TBH-BE! No coupon needed -- Simply mention that you're a TBH-BE member. The Jewish War Veterans - Post 305 welcomes District Attorney of Delaware County, Kat M. Copeland, who will speak about her 25-year career as a prosecutor. 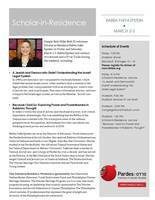 Meeting and program will be at Temple Beth Hillel-Beth El in the Library. Light refreshments served; all are welcome. The Institute for Jewish-Catholic Relations at St. Joseph's University’s spring lecture series is on “The Land and State of Israel in Christian Theologies.” Three Christian theologians (Evangelical, Mainline Protestant, and Roman Catholic) will present their perspectives on the topic. Free Admission. Celebrate Israel70 with a Philadelphia screening of this Jerusalem U film that's been screened at over 120 film festivals around the world.